Gus Van Sant's Elephant covers the timely and terrible topic of school shootings. Inherently provocative, it's nonetheless the best film we could imagine about such a thing. Van Sant chooses to present the story using pure ultrarealism, with absolutely no embellishment or explanation. No one is afforded any cinematic villainy, heroism or redemption - though there are, one could argue, moments of all three. In the end, however, you are left with the same questions you might have had in the beginning. Yet it's also a beautiful film - filmed in gloriously wide aperture (we think?) with gloriously sensitive film, Gus Van Sant's technical skills give brilliance to mundane real life. Before the two shooters enter the doors, we follow them - and a number of other students - as they pass through the labyrinthine halls, their homes, their parents' cars and live their daily lives. It would be easy to label them according to a Breakfast Club menu of teen types: the sensitive photographer Elias (Elias McConnell), the trio of bulimic cool girls (Brittany Mountain, Jordan Taylor and Nicole George), the football player (Nathan Tyson) and his girlfriend (Carrie Finklea), and the charismatic, peroxide-blond John (John Robinson). But these are just the labels we choose to apply; there's barely any dialogue, characterization is at best opaquely hinted at, and most scenes feature only the muted murmurs of passing students, the clatter of closing lockers and the squeak of sneakers on linoleum floors. We spend much of the film following these characters back and forth during their typical day, and we frequently replay the same moments from several viewpoints. In the end, we have an overarching portrait of an average, large, American high school. Everything is then swiftly destroyed in the final twenty minutes, but even that destruction is muted, removed, difficult to follow and therefore terrifying. It could be anywhere, because it looks like everywhere. One or two moments satisfy stereotypical movie criteria - there's a relatively thin narrative arc surrounding John and his drunken dad - but mostly the film is meditative and exposition-free. The two shooters, Alex (Alex Frost) and Eric (Eric Deulen), are enigmatic. While there is a token scene of bullying for Alex, as well as some ambiguities regarding their relationship, the psychological complexities are never explicitly explored. We never quite understand why they choose to do what they do. We can only watch them as they prepare. And perhaps that's the film's only condemnatory note: when Alex and Eric lazily browse the Internet and order a gun, we couldn't help but feel activist alarm about American gun control. This will not do! But we can let that debate rest for another day, the film itself provides no argument. 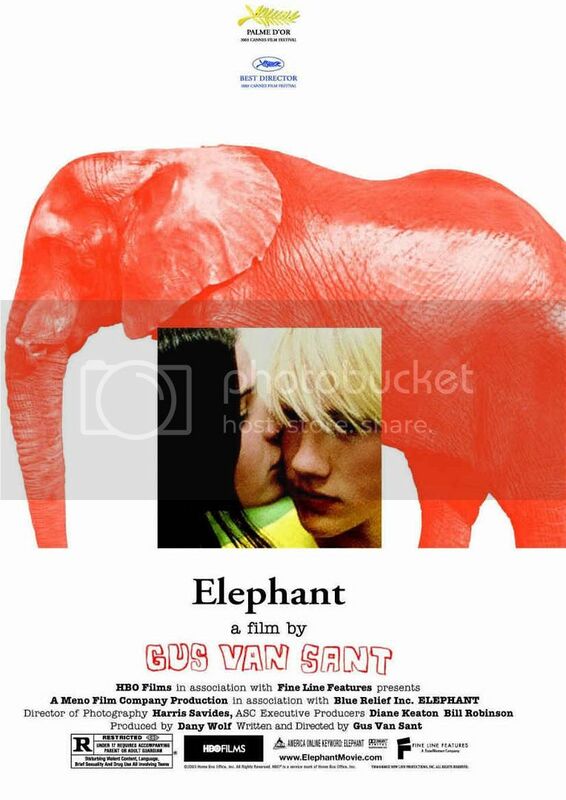 Indeed, apparently Gus Van Sant intended the title to refer to the parable of several blind men describing an elephant by feeling its individual parts: in the end, they variously describe the elephant as being like a drain pipe, a fan, a pillar or a throne, based on which part of the elephant they touched. Similarly, the film presents one event through various prisms. Yet even composing all this observational evidence together, we still don't understand the elephant at all.